Who will build the most magnificent palace? 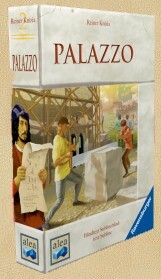 In the game of Palazzo, set in the age of the late renaissance, the players slip on the roles of wealthy landowners, who compete against each other to build the most valuable palaces. As their constructions grow, the players must choose from the available palace modules from the quarries, so they can add to their palaces. Of course, none of this building can be done without money, so sometimes a players must take time out to earn some money so he can afford to continue his building projects. Palazzo is a fast but fairly deep tile laying auction game. It reminds me a lot of Alhambra, but it plays faster and has at least as many meaningfull decisions. I particularly like the way the bidding is restricted by what colour of currency you have - this makes it very difficult to predict what others are able/willing to bid. It is also a plus, that is plays very well with just 2 players.